Gabrielle Gascon is currently finishing her PhD in the Department of Earth and Atmospheric Sciences at the University of Alberta, Edmonton Canada. 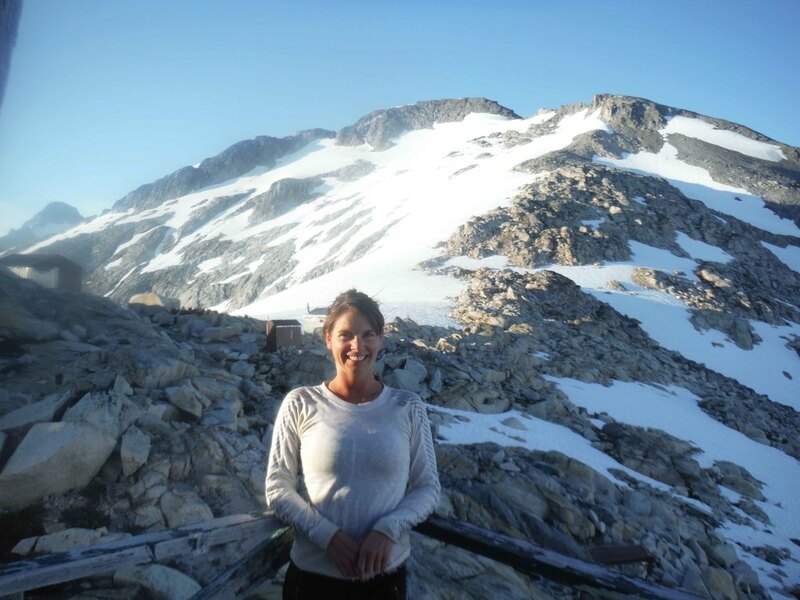 Her work focuses on ice-climate interactions on the Devon Ice Cap, Canada, where she has participated in several field seasons. In her spare time, she enjoys swimming, camping and canning fruits and vegetables. Leah Nelson: Is this your first time on the Juneau Icefield? Gabrielle Gascon: Yes, I’ll be here lecturing and helping students with their projects that are based on ice-climate interactions. LN: What research are you working on? GG: My work is based in the Canadian Arctic, where I focus on ice-climate interactions using a variety of field observations combined with numerical modeling. Using data gathered from weather stations, net radiometers, and ground penetrating radar we can investigate melt season characteristic changes. LN: How did you get interested in studying ice-climate interactions? GG: While working on my masters degree at McGill University, I was studying winter storms from Iqaluit in the Canadian Arctic. We used many ground base instruments but we also collected data using an aircraft to fly into storms. While flying over the Penny Ice Cap, I was struck by the many interactions that are possible between glaciers and climate. Both of the systems depend on many variables which makes the possible interactions so interesting to study. LN: What is the greatest adventure that your research has taken you on? GG: While doing research on Devon Island, I spent five weeks in an eight by eight meter tent. The experience of exploring the largest uninhabited island in the world was rewarding. LN: If you could bring any person on an expedition, who would it be? GG: Peter, my boyfriend. He does similar field work and was with me during those five weeks in the tiny tent on Devon Island. Otherwise, I’d bring any one of my family members to show them what I’m working on for my research. LN: Why is glaciology research important for non-scientists? GG: Glaciology is important for everyone to understand because glaciers act as freshwater reservoirs and impact sea level. For example, in the Rocky Mountains, glaciers are the main source of fresh water for many cities. The melting of larger glaciers, such as the icecaps, could greatly influence sea level, which in turn has a profound effect on people that inhabit coastal areas. The cryosphere is a key component of the earth system; changes within in it are significant to all of us. LN: What advice would you give to aspiring young scientists? GG: I would tell young scientists to decide your career and area of study based on your interests and not on potential salary. If you find that you don’t like what you’re doing, change it. And don’t put your career above your personal life -- be happy.